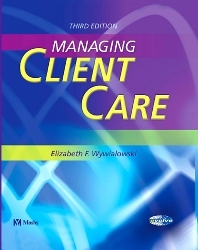 Content focuses on client care management, rather than staff management, to go beyond basic management concepts and help those whose role will be managing quality client care. Essential theoretical information is covered with an emphasis on practical application. Application Exercises at the end of each chapter challenge readers to apply what they've just learned. A brief clinical situation is followed by questions or commands to describe the solution, based on what was learned in the chapter. Critical Thinking Scenarios at the end of each chapter give readers a short case study to consider and questions to test their application of knowledge. A competency-based format is applied throughout and is based on a research study that identifies clinical management skills needed by beginning staff nurses. Objectives and Key Concepts at the beginning of each chapter provide readers with a glimpse at important information contained within. Key concepts are also shown in boldface upon first mention in that chapter. Cartoons are provided throughout to keep readers more actively interested in the text content.